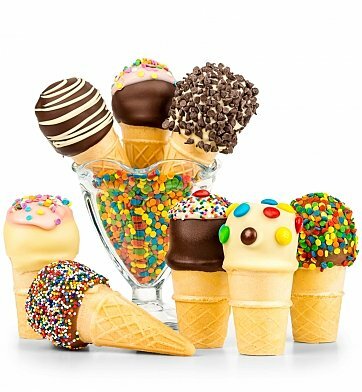 Perfect as a party favor or to send your best wishes on any occasion, this vibrant batch of tender "ice cream cone" cake pops are every bit as delightful on the eyes as they are on the palette. Eight moist cake pops are are hand-dipped by our artisans in white, milk or dark Belgian chocolate and decorated with a variety of colorful candies and confection drizzle, taking on the pleasing shape of a colorful ice cream cone. Ice Cream Cone Cake Pops is a hand delivered gift. These gifts are delivered by one of our local design centers located throughout the United States and Canada. Same day delivery is available for most gifts when ordered before the cutoff time. The cutoff time for Ice Cream Cone Cake Pops is 7 AM in the recipient's time zone. 8 fresh-baked cake pops decorated to look like ice cream cones! Chocolate and vanilla cake dipped in Belgian chocolate, inside sugar cones. The recipient liked the gift. Sent this to my niece in college for her birthday. They arrived timely & cute presentation. Most important was they tasted yummy!